Our political leaders seem to have taken impeachment as a part of constitution implementation, particularly when it comes to implementing Article 101 (2) of the constitution. Including the quashed complaint against Judge Ananda Mohan Bhattarai that was filed by four MPs in September 2016, we have now had three impeachment motions within six months. Let me remind the readers that the purpose of this write-up is not to specifically deal with this or that Karki. The purpose rather is to show that failure to deal appropriately with one impeachment motion has landed us into a constitutional quagmire. With the apex court issuing “poetic and philosophical” stay order on impeachment motion against Chief Justice Sushila Karki the confrontation between three organs of the state is now overt. The deepening of conflict could be seen with government representatives skipping the 65th Law Day function organized by Supreme Court on May 9. Unfortunately, it is not possible for legal eagles to issue another interim order asking everybody to attend the function. On October 19, 2016 the first impeachment motion was filed against Chief of CIAA, Lokman Singh Karki (LMSK). In January this year, the Supreme Court disqualified him as CIAA chief on a pending court case related to his appointment, thereby sparing the parliament from having to vote on the impeachment motion. Basically, the parliament was in a fix: How to impeach an official who had already been disqualified by the court? Therefore, the parliament’s Impeachment Recommendation Committee (IRC) decided not to impeach LMSK but to investigate his possible excesses. On April 30, 2017 the media was rocked by yet another impeachment motion. This time the person targeted was no other than Nepal’s first lady Chief Justice. With CJ Karki retiring on June 7, the move was a clear strategy to keep her from performing her duties, rather than removing her outright. There are similarities as well as differences between the two motions. Both are historical in a sense that they involved chiefs of apex constitutional bodies. And it is not just about two high-profile Karkis; the behind-the-scene dramas are as intriguing. Going by rumor mills in Kathmandu, had the impeachment motion against LMSK been delayed by a day or so, the outcome would have been totally different. 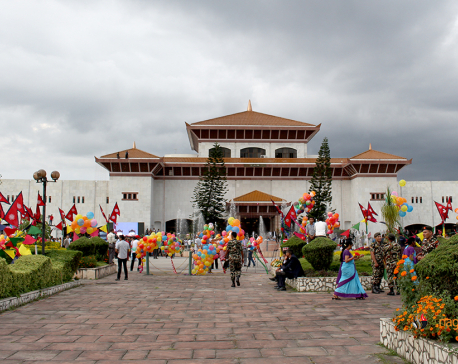 The motion was filed only a couple of hours before LMSK was scheduled to land at the Tribhuvan International Airport. The same goes with the CJ’s impeachment. A delay could have caused Prachanda the same humiliation that he experienced at the time of army chief’s sacking in 2009. Congress President Sher Bahadur Deuba also has a defamation case pending at the court. With the stay order on May 5 reinstating CJ Karki and directing the parliament to put the impeachment motion on hold, the drama has yet another sensational twist. We are now into a kind of makeshift truce after the parliament decided to adjourn until May 18. Speaking to the media, the Speaker has already expressed her displeasure at the court stay order on impeachment motion. The executive seems to have a wait-and-see approach while the reinstated CJ is reported to have said that she will not go on leave, as was widely speculated, but will refrain from deciding on court cases. It sounds like every stakeholder is moving cautiously. In Nepal, what is ritual is often visual and what is real remains obscure. It is difficult for a common man to comprehend unfolding political scenarios. There is also a talk for a package deal among political actors on all contentious issues: constitution amendment, second phase local election, budget, impeachment motion and court stay order. Hopefully, this may lead to a new political settlement. On the similarity between the two impeachment motions, if LMSK was responsible for investigating and prosecuting corruption crimes, CJ Karki was also responsible for adjudication on corruption crimes. The animosity between the two ran so deep that in September 2016 the public enjoyed a live TV drama about the court issuing summons to Mr Karki. It is bewildering as well as bemusing that two high-profile officials who are responsible for fighting corruption have been have been labeled with charges of being paagal (insane) and bhrasta (corrupt). The so-called civil society members who were dead against LMSK during his impeachment motion this time sided with CJ Karki. They heaved a big sigh of relief after LMSK’s departure in February but have been baffled and irritated at having to return to the streets once again. Dr Govinda KC, a staffer at a state-owned university, has even issued a threat of fast-unto-death if the parliamentary motion against the CJ is not withdrawn. Where on earth does a public servant enjoy the privilege of organizing and participating in anti-government rallies? The first impeachment motion against LMSK was filed by 157 MPs—107 from CPN-UML and 50 from Maoist (Unity Center). In the second motion against CJ Karki there are 249 MPs—169 MPs from Nepali Congress and 80 MPs from Maoist (Unity Center). During the filing of the first motion, Congress gave LMSK the benefit of doubt; this time UML has given benefit of doubt to CJ Karki. In both cases, we have had media reporting of MPs’ fake signatures or misuse of their signatures. This time, we are lucky that no ‘tipex’ has been used to conceal Signature Number One. And everybody can guess who this signature belongs to. The ire of UML Chairman KP Oli is easy to understand as the signatures of Nepali Congress MPs were reportedly collected some time back to file a no-confidence motion against PM Oli. There is no dearth of humor in our politics. There is also stark contrast between two impeachment motions. Unlike LMSK’s impeachment where there was no call for its withdrawal, the CJ impeachment motion faced widespread call for withdrawal. This call for withdrawal of CJ impeachment motion came from opposition parties, civil society members, media professions, legal pundits and even foreign agencies. One can also observe public rallies and demonstrations and signature campaigns in favor of the CJ. At this stage nothing can be done with the constitutional provision whereby an official is immediately suspended when 25 percent lawmakers register an impeachment motion. The problem started the day the court, with its disqualification verdict, spared the parliament from voting. The appointment of CIAA chief was, primarily, a political decision. Therefore, an appropriate place to decide on this issue was the parliament, not the court. The court verdict might have saved the parliament from voting but it invited another misfortune. Some blamed Deuba for delaying parliamentary impeachment process till the court decided on the pending case of LMSK’s appointment. But the court investigating LMSK appointment was a case of the judiciary’s encroachment into the privilege of the executive, not much different to the judicial intervention in performance appraisal and appointment of police chief. I do not mean to defend LMSK, but the court must furnish a satisfactory answer to this question: Why didn’t his years of service at the royal palace secretariat count in meeting the minimum 20 years service requirement to be appointed the Chief of CIAA, when employees from the same secretariat could be safely absorbed into civil service after the abolition of monarchy?